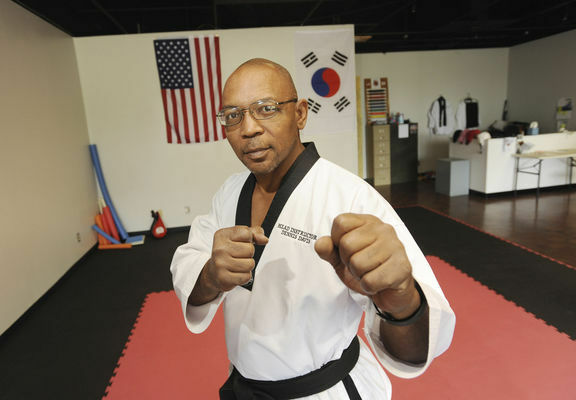 ST. JOSEPH — Dennis Davis has big plans for Majestic Taekwondo Academy.The second-degree black belt opened his academy at 2538 Cleveland Ave. in St. Joseph in early May. Davis holds a bachelor’s degree in business from Baker College and has experience managing taekwondo schools. Taekwondo, which is the art of self-defense, is recognized as one of the oldest forms of martial arts in the world. Davis has been practicing martial arts for 36 years. Herald-Palladium staff writer Tony Wittkowski sat down with Davis to discuss how he went about starting his business. When did you first get involved with taekwondo? I started when I was 12 years old in Berrien Springs. They had a taekwondo academy on the main strip there as you come in from Eau Claire. It was just 15 minutes away. Have you been doing this your whole life? It’s been off and on my whole life. I’ve studied other forms of martial arts and self-defense through the military and law enforcement. Now that I’m retired, I want to come back to my roots. From the police in Muskegon Heights. I was there for eight years and I was at Benton Harbor for 10 years before that. What was it about taekwondo that made you gravitate toward it? The focus that it taught me. I started when I was 12, so by the time I was 13 I already had it set in my mind on what I wanted to do in my life. It taught me that you have to set goals for yourself. My goal was to become a police officer. After you retired as a police officer, what made you want to open up your own taekwondo academy? I managed another school for the past eight years. I won’t say their name, but most people who know me know what school it is. I’ve always wanted to do this, and when things didn’t work out with me taking over at that school, I decided to open my own. I took all my savings and here I am. What was the process like getting this started? I have a business degree, so I had a pretty good start already on how to do it. When we were opening, Cornerstone (Alliance) looked over all my paperwork and saw everything was in check. I drew up the legal contracts and had my brother-in-law, who’s a lawyer, review those. Then I got my insurance, and since I drive by here everyday, I stopped to take a look at the place. What are some of the main teachings you try to project to your students? My goal when I opened this school was to make taekwondo traditional again. To preach discipline, respect and courtesy. Focus is a big one, especially with these younger kids. In my youngest class, I have a student that just turned 4. She’s below the other students, but her parents and relatives have all commented on how much better she’s doing now. I do meditation with the kids. It’s not so they just meditate, it’s more of a way to get them to be able to sit still and settle down. They can’t make faces. They sit perfectly still. They don’t know how long it will be, but I keep adding on each time. It’s a way to refocus and gain some perspective. Contact Tony Wittkowski at twittkowski@TheHP.com or (269) 932-0358. Follow him on Twitter: @tonywittkowski. Unemployment rates increased throughout Southwest Michigan in July. The state’s Bureau of Labor Market Information and Strategic Initiatives reported temporary summer layoffs of support staff in education – private and public – that started in late June continued the rise in unemployment rates regionally. Jobless rates increased by an average of three-tenths of a percentage point in Allegan, Berrien, Cass and Van Buren counties. Three of the four Southwest Michigan counties recorded jobless rates below the statewide-unadjusted unemployment rate of 5.4 percent in July. Allegan County’s unemployment rate – which was the lowest in the region – rose from 3.6 percent to 3.9 percent. Berrien County upped its jobless rate from 4.6 percent to 5 percent. Cass County increased from 4.2 percent in June to 4.9 percent in July. Van Buren County remained the highest in the region while increasing its unemployment rate from 5.1 percent to 5.4 percent. Despite the large rate, it is well below the 6.4 percent unemployment rate Van Buren had in July 2015. Michigan finished with a 5.4 percent unemployment rate in July, while the U.S. produced a 5.1 percent jobless rate. Leisure and hospitality continued to display strong seasonal hiring activities in July in Berrien County. As a result, total non-farm payroll employment in the area inched up by 100 jobs, despite the loss of 400 positions in local public education. Total non-farm payroll jobs in Berrien County increased to a total of 64,300 in July. Since July 2015, the county has recorded substantial employment gains in leisure and hospitality, trade, transportation, warehousing, utilities and manufacturing. However, the area registered job cuts in professional and business services and in other private services. Employment in the rest of the sectors remained flat year to year in July. Total non-farm payroll employment in Berrien County was 1,400 – or 2.2 percent – above July 2015 levels. ST. JOSEPH — Brittney and Jonathan Meier wanted to make every day an adventure. That’s why the couple opened Wanderlust Outfitters, a specialty outdoor store that sells clothing, apparel and gear. The Meiers opened the store last week, but had its ribbon cutting ceremony Thursday at 120 State St. in downtown St. Joseph. Hiking has always been a passion for the co-owners as a sort of escape. Brittney Meier said they travel down to Tennessee a couple of times year and also spend time on the Appalachian Trail. That niche brought them to St. Joseph. Meier said they began their efforts in March by contacting brand companies to see what they could carry. Once they found interest, Meier said they secured the downtown space. They now carry brands including Columbia, Marmot, Kuhl, Osprey, Thermarest, Black Diamond, Point 6, Camelbak and more. Meier said the store recently got official approval from North Face to start carrying its apparel. Coming up with the name was easy for them, too. The store is open from 10 a.m. to 7 p.m. Monday through Thursday, 9 a.m. to 9 p.m. Friday and Saturday and noon to 5 p.m. on Sunday. Wanderlust Outfitters will be open year round, but hours may differ in the winter. Since opening Aug. 24, Meier said the reception has been great to see. Meier said they are still taking applications, but until they get a better feel on staffing for how busy it becomes, they will stick to their core group. Applications can be retrieved in person. Those interested in learning more about the business can call 269-281-7047. BENTON HARBOR — Maytag had a new set of appliances coming out during the presidential election, but needed an idea for marketing. That’s when the “No Smear” campaign came to fruition. In an attempt to raise awareness for its fingerprint-resistant stainless steel appliances, Maytag surveyed consumers and discovered more than half of them are annoyed by political smears on social media feeds. The brand decided to link its product launch to the timely topic and give consumers the option of installing a free computer plug-in to remove political smears online. Anyone can download the Chrome desktop plug-in, which helps block political smears within their Facebook and Twitter feeds. In addition to blocking the negative post, the plug-in replaces it with funny content incorporating patriotic pictures and phrases. For example, if a Facebook friend posted something angry about a presidential candidate using aggressive words or inappropriate language, it would be replaced with a bald eagle or Uncle Sam giving the reader the thumbs up accompanied by humorous copy. Bosch said the plug-in was in development for several months before it went live Aug. 25. Maytag began its work by teaming up with Omnibus Research to conduct a survey on Americans’ attitudes around political discourse and their newsfeed. In the survey, 53 percent of respondents said political smears are the top content type that triggers annoyance or anger. Another 73 percent admitted to having unfollowed, blocked or hidden someone on social media because of content they did not like. 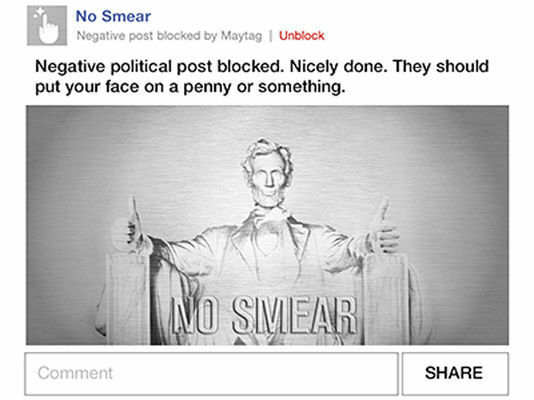 University of Michigan professor and political scientist Arthur Lupia consulted with Maytag on the project to help ensure the plug-in stayed bipartisan and only blocked smearing political content. Bosch said Lupia provided counsel on the plug-in’s keywords to ensure the algorithm and campaign overall was accurately capturing the current negative political discourse. Lupia was also there to make sure Maytag upheld its nonpartisan position. The keywords do not target a particular political candidate or party. To remain fair, Lupia said users are unable to customize the plug-in based on their own political stances. Lupia said he was actually surprised the plug-in wasn’t created sooner. Maytag enlisted actress and comedian Abby Elliott to be the face of the campaign in order to raise awareness for the election season and its products. Bosch said he can’t speak to whether Maytag will do something like this campaign again. However, Bosch said they will continue to see what else they can do to push the brand. U.S. Rep. Fred Upton is being called out by a Democratic opponent in response to recent price hikes in pharmaceuticals. Democrat Paul Clements, who is running against Upton for the 6th District in the Nov. 8 general election, is claiming his opponent has done nothing to stop the increase in pharmaceutical prices. Clements’ comments come amid the latest pricing scandal regarding the 400 percent increase in EpiPen prices by the company Mylan. The EpiPen, an automatic injection device that delivers a dose of epinephrine to a patient suffering a severe allergic reaction, now costs more than $500. The increase puts the EpiPen out of reach for many of the low- and middle-income people who face allergic reactions to food products and animals. Upton, R-St. Joseph, spearheaded a letter this week sent to FDA Commissioner Robert Califf posing questions about the agency’s regulatory process for generic drugs, particularly the EpiPen Auto-Injectors. Upton chairs the U.S. House Energy and Commerce Committee. Clements claims Upton had a role in blocking a number of measures that could reduce the price of several pharmaceuticals. The Democratic candidate alleges Upton played a part in negotiating Medicare Part D drug costs and reimporting prescriptions from Canada. Clements released a statement of his own in response to Upton’s remarks made earlier this week. In the news release, Clements said price gouging is not a new problem and alleges Upton has avoided taking action. This statement was in reference to Upton defending the School Access to Emergency Epinephrine Act, which supports schools and ensures they have the capability to treat allergic reactions. In response to Clements’ comments, Upton said he has written to the U.S. Food and Drug Administration to learn what has delayed approval of generic epinephrine auto-injectors, which could be affordable alternatives to EpiPens. “I am one who is also focused on advancing common sense legislation to address the growing problem of rising prescription drug prices. The issue is becoming a major concern for many families I have heard from,” Upton said in a news release. Last year, the U.S. House of Representatives passed the 21st Century Cures Act – legislation Upton introduced alongside U.S. Rep. Diana DeGette, D-Colorado. The legislation has nearly two dozen provisions aimed at bringing affordable therapies and cures to patients in need. Upton said the legislation works to lower barriers to medical innovation and safely speed up the FDA’s approval of drugs and devices. BENTON TOWNSHIP — Elden Piontek will resign as Benton Township superintendent Sept. 30. Piontek had submitted a letter of resignation to the township Aug. 23, but waited to release the news until after he had spoken to each trustee. Piontek’s role within the township was reduced in January. His work hours were lowered to an average of one day per week with a reduction in annual salary from $57,000 to $28,000. The new contract that was approved by the township’s Board of Trustees had Piontek attached to the township through December 2018. Piontek had been working five days a week prior to the adjustment. Piontek started working for the township as a controller in 1975. After he retired in 2010, Piontek came back as a superintendent in 2013 when its controller took a year off. Treasurer Debbie Boothby has worked with Piontek for 12 years and said she was thankful for his work. Boothby said Piontek was instrumental in getting several projects off the ground and played a big part in negotiating numerous employee contracts. It is unknown if the township plans to hire another superintendent or eliminate the position. Kelli Nelson serves as controller and has already taken over many of Piontek’s responsibilities. Nelson’s increase of work days from three to four were made to assume additional duties in January. Nelson’s contract was extended six years, which runs from November 2015 through November 2021. She was first hired to serve as the township’s controller in December 2009 and worked through December 2012. Then she took one year off and came back in the beginning of 2014. BENTON HARBOR — Jayme Cousins, Jamie Kastelic and Marydawn Taggart have a few things in common. They started a business that has grown since their inception. Their services all lean toward better health and lifestyles. And now all three will be part of a panel discussion in September. The Women’s Business Center at Cornerstone Alliance has asked the three to speak at its annual event called “Celebrating the Entrepreneur in All of Us” from 11 a.m. to 1 p.m. Sept. 22 at the Shadowland Pavilion on Silver Beach in St. Joseph. The event’s focus highlights a panel of three local entrepreneurs who share the common denominator of health and how it led each of them to open their own business. Taggart, owner Maddog 5/1: Revolutionary Fitness in St. Joseph, has expanded her business through 2014, when it moved from its original Benton Harbor location. The business proved one of the hardest financial times for her and her family. Taggart said she was ready to start a business and chose a career in fitness because it was one of many things that brought her comfort. Cousins, who with her husband runs the Mason Jar Cafe in Benton Harbor, is another panelist. The Mason Jar Cafe in the Benton Harbor Arts District is known for working with local farmers and food producers in order to serve organic, unprocessed, antibiotic-free, not previously frozen and healthy food. Kastelic, owner of Spero-hope LLC, sells organic health care products online throughout the country. Her decision to open a business came after she was diagnosed with breast cancer in 2012. After extensive research on what causes cancer in women her age, she discovered a common ingredient in several products called paraben that floods her body with estrogen. The mission was to make her own products – alongside a friend – that excluded paraben. The event’s keynote speaker is Kathy Beauregard, Western Michigan University’s athletic director. Beauregard is among three female athletic directors in the Mid-American Conference and the first at Western Michigan University. She will share her experiences of her 37 years at the university. Anyone interested in learning more or buying tickets can call Dubelsa Mata at 269-925-6100 or email at dmata@cstonealliance.org.